The Aikikai ensures that support is given to those who encounter additional costs so they can coach and support also for clubs. The ways this is done is detailed on the document called "Courses / Qualifications required when operating a club". Support is given to start up clubs and anyone wanting financial support to do this should contact the Aikikai Treasurer. The Aikikai offer free CPD courses in the form of Dan Grade and 1st Kyu courses. Support to those undertaking BAB Coaching courses or associated Units/Modules. Support to those Coaches or prospective Coaches for First Aid qualifications - that are mandatory in the Lancashire Aikikai. - Full reimbursement for Club Welfare Officers and our Child Protection Officer to attend the mandatory Safeguarding Children course. Travel expenses in certain circumstances. 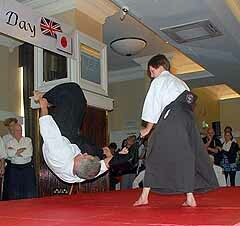 Clubs in the Aikikai are expected pay half of the cost of Venue insurance required by the BAB for operating a club. The Aikikai pays the other half when processing venue insurance to the BAB. The Treasurer will always consider help in other instances - get in touch.